Heavy-duty extruded aluminum is stronger than other comparable products, such as wood, vinyl, and roll-formed aluminum. Our heavy-duty extruded aluminum is coated with a beautiful electrostatic finish that resists weather exposure, peeling, cracking, and fading, so you won’t have to spend unnecessary time keeping up on annual maintenance. 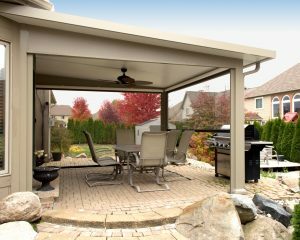 You’ll be able to enjoy your new patio cover for years to come, as heavy-duty extruded aluminum resists insect infestation, deterioration, and rotting. Customers who purchase one of our patio covers will be able to choose between a solid-roof-style patio cover or a carport-style patio cover. They’ll also get to choose which column style they prefer, as well as the color of the patio cover, and whether they would like to include any additional accessories or upgrades. Because our patio covers are manufactured by TEMO, our customers also receive TEMO’s limited lifetime transferable warranty, which will be of considerable value should they ever decide to sell their home. When you hire SRA Home Products to install your new patio cover, you can rest assured that you’ll be working with some of the most experienced professionals in the business. We’ve been in operation since 1988, and our average employee has worked with us for at least 15 years. Because of our never-ending commitment to customer satisfaction, we’ve even achieved an A+ rating with the Better Business Bureau. Please contact us today so that we can help you choose which of our patio covers will work best for your home in Blue Bell, PA.